Happy Easter to Everyone out there! 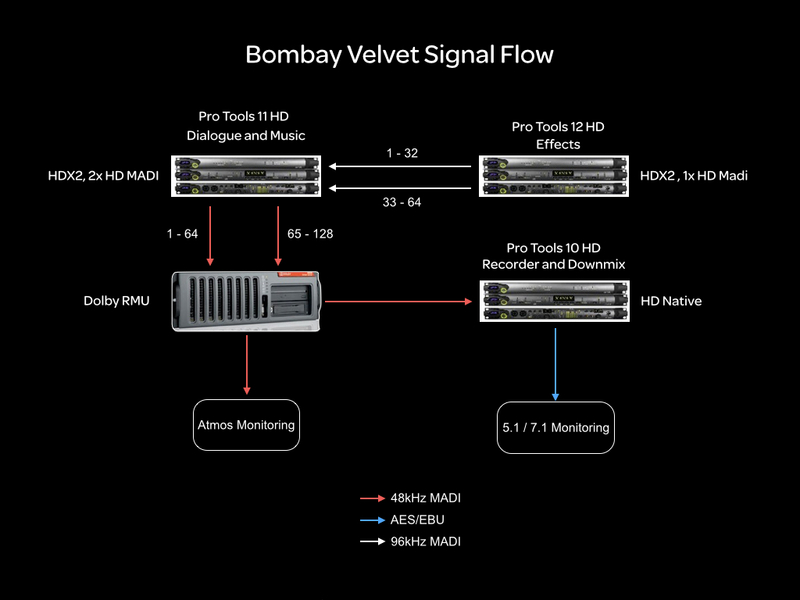 This time, lets have a look at the signal flow we have adopted for Bombay Velvet. This project is unique in the fact that we are running the sessions on 96kHz which is a world first for a Dolby Atmos movie and all credit goes to Kunal Sharma for initiating that. All the Dialogues, Music and Effects were recorded at this Sample rate. It would have been practically impossible to run so many tracks at this scale unless it was an HDX system and we have 2 HDX2 systems. We are running the Dialogue and Music on a Pro Tools HDX2 System with 2 HD MADI IO and Version 11.3.1. The Effects, Foley and Ambience is running from another Pro Tools HDX2 system and 1 HD MADI IO with Version 12. There is a third system which is an HD Native system with Pro Tools 10.3.9 that is used for recording the Mixdowns. All of these systems receive clock from a Rosendahl Clock generator. They are also all on Satellite Link which is included with Pro Tools 11 HD and above. We have kept the Dialogue and Music Machine as a Satellite Link Administrator. We also have a D-Command that is used for the Fader rides. From the Outset, we knew that there was going to be a challenge to run so many tracks from one system. So we had 2 of them. The other main challenge was that the RMU will only accept signal at 48kHz. So, how do we supply that and why go through all this trouble? We solved the issue of the DSP and power by adding another HDX2 system with an HD MADI card. Now, at 96kHz, one issue is that the track count will be halved and so will the output. So instead of getting 64 IO it would be 32 IO. That wouldn’t be enough for a film of this scale. But, the HD MADI is capable of delivering split Outputs from its 2 ports as in the table below. All that we had to then do was to enable SRC (Sample Rate Conversion) on its output to the RMU to convert from 96kHz to 48kHz. But there was another issue. How do we send the beds from the FX Machine to the RMU? For this we sent the outputs of the FX Machine to the Input of the Dialog and Music Machine that was feeding the RMU. This way. the Dialog system got an additional 10 Objects and we were able to use the whole of 128 Outputs which otherwise would not have been possible. Why then take the pain of running everything at 96kHz if we are finally going to monitor in 48kHz? This is a difficult question to answer until you manage to hear the difference. We did tests with the session running at 96kHz and session converted to 48kHz. The Reverbs and EQs just sounded far more cleaner and fuller on a 96kHz session even if the output was converted. This convinced us to stick to this. Moreover, the advantage of running everything at 96kHz also means there is more information in the higher frequency spectrum that has been recorded. Plus, the sounds that are being pitched for design sound more cleaner and with no artefacts. You can read more about this in this post. Plus with all the amount of analog emulation from Avid Heat, UAD and many more, the audio just sounded full. One thing that is really good with Pro Tools Version 12 is the ability to have unlimited Busses and also the ability to open a session with our IO setup or even import an IO setup from a session rather than saving the IO setup externally. That is really cool and does save us a lot of time. In addition, there is also the ability to automatically map the monitoring to what the monitoring output in the stage is without rerouting anything. This is a huge benefit and we decided to use and explore this on the FX machine. We did spend some time figuring this and testing the workflow before we started the whole mix. This was crucial as once we are in the mix, it becomes very difficult to troubleshoot and change things around. Next post will be about the Premixes and our approach. I will also get Justin’s input on the song if we complete by then. Till then, enjoy and share this blog.